So this weekend, and probably next, I set my short term mission on getting my cooking groove back. I am sure that Angela Basset would approve too. She got hers back a few years ago. I decided to make a quick stop at the Tarry Market in Port Chester, New York. I have talked about this place before. 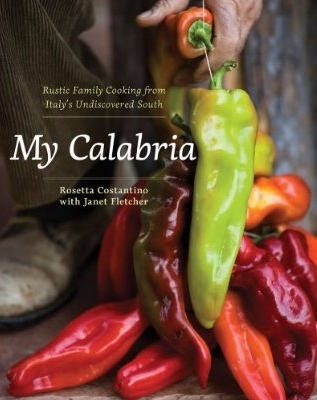 The Market is the creation of behind the scenes culinary star, Joe Bastianch (his mom is Lidia from PBS) and celebrity chef Mario Batali, based on the the gourmet super mecca of Eataly in NYC. If you want to see some pics of the place , check out the blog at small bites. Tarry Market is indeed, Westchester and Fairfield county's version Eataly, just in a smaller. Before I move on , contrary what some have said, you can't find everything they sell there on Arthur Avenue. As you folks know, I shop there too. I picked up a few items. I won't list them all. For lunch a few slices of focaccia "da portare via". This stuff is really good, full of flavor, not stingy on the EVOO and herbs, and always fresh and soft. Their dough is reminiscent of a wet ciabatta dough. That makes it lighter and very fresh looking. I went for the vegetable based slices: potato and goat cheese, and the "primavera", which sports peppers, onions, some zucchini slices and herbs. The foccacia in my opinion, is a reason alone to visit the Tarry Market. Grab a few slices, and then sit yourself in the front caffe', right next to the self service wine dispensing machine. A glass or two of some of the more crisp stuff will easily work with their fresh fare. Then came the shopping for dinner. After a good roaming in amazement at the progress that the store had made since the last time I visited, I landed on "pici" pasta. This is a thick, spaghetti-like artisan pasta that is sold in "nido" format, meaning rolled up like a roundish bird's nest. You will find angel hair pasta packaged this way too as well as dried tagliatelle. The "pici" were the perfect pasta for a cauliflower based sauce made with shallots, champagne and a bit of fontina cheese. Usually they are prepared with bold , hearty sauces. My sauce was more on the delicate side, or so I thought. This is a pasta that will remain al dente, but that is also very delicate during cooking. it tends to break into small segments if you are too rough with it. As the past cooks, do not stir as you would do with penne or spaghetti, just use very slow and gentle lifting motions to make sure that the "nests" open up and the pasta does not stick to the bottom. Your pasta water must be abundant otherwise you are headed for disaster. The dish is very simple to prepare. Clean the cauliflower and cut into small florets, removing some of the thicker stems. Start with a high pan, add the shallots, garlic, S/P and of course EVOO.. Cook low heat until the shallots get soft. Do not brown or caramelize. Add then champagne. Reduce. Add peppers and cauliflower florets. Cook on low heat with a lid. Add some fluids (pasta water or splash of white wine) if needed. Towards the end , add the parmigiano and the fontina cheese in small cubes. These cheese will melt , and add a lite creaminess to the sauce.Slightly mash some of the vegetables towards the end so that they bind better with the pasta. For the pasta, use a larger than usual pot filled with salt water. 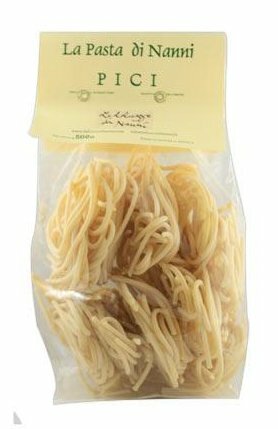 Cook the pici until tender. Al dente here is a very relative term, as this pasta will retain more stiffness than other kinds. For some people, the pasta might even seem uncooked, but not for us natives. Keep some pasta water to adjust the vegetable sauce if need. Once the pasta is cooked, toss with the cauliflower sauce. Top off with a few cubes of fontina. White wine works best. We went for a chilled Pinot Grigio. I also made some nice Shitake mushrooms with Poblano Peppers as an accompaniment to some seafood, not discussed here. This mushroom dish is easy to make , just make sure that you select ultra fresh mushrooms, and peppers. I find that fresh poblanos hold up very well when cooked, and remain crisp and flavorfully spicy. I kicked up the spice level just a bit with a handful of hot Mexican red peppers, sliced and tossed into the pan at the last minute for extra crunch and heat. Now back to the Market again. I did miss one thing. I did not get a chance to introduce myself to Joe Bastianch.. He was in the store that morning. I saw him roaming the aisles. For some strange reason Joe kept running back into a large refrigerator room behind the meat section (were the uncorked barrels back there?). So when I was all done with my shopping and went looking for him, he was gone. I mean gone as in "vanished into thin air" and no where to be found. Oh well , there will also be a next time as I am sure to go back to the market.. Who knows, I might even get lucky, and get to chat with the big guy who likes to wear orange crocs.